I had huge hopes for The Curious Case of Benjamin Button. The story of someone being born as an old man and aging in reverse seemed like a novel idea that could go in many different directions. There was also the fact that it was directed by David Fincher, one of my favorite modern directors after his streak of great 90s films (Seven, The Game and Fight Club). Add in the always charming Brad Pitt and a trio of some of the best actresses going today in Cate Blanchett, Taraji P. Henson and the magnificent Tilda Swinton, and its greatness seemed a foregone conclusion. Even the Academy liked it after having given Fincher the cold shoulder for a decade and half. Surely this was a film that was destined to make me fall in love with it. But it wasn’t. 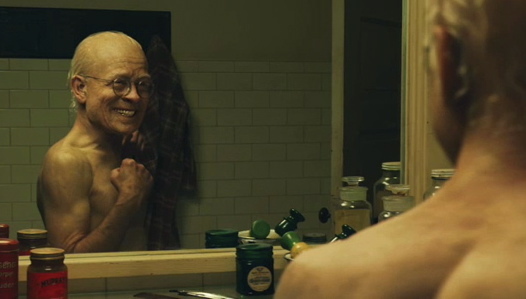 The movie impresses on the technical side, with some great makeup and effects works to show Brad Pitt as both an old man and a teen, and there’s nothing bad about the acting. But it’s a bit of a bore to sit through, spanning almost three hours with little of interest going on. The main problem, I think, is that the premise and the type of film don’t gel very well. Tyler Durden in his prime. Comparisons have been made to Forrest Gump (both it and Button were written by Eric Roth), and it’s easy to see why. Both deal with people with some kind of disability and chronicles them as they go through their lives. Such a film relies on its protagonist to a high degree. We need to care about what he does in one way or another. Sympathise with, relate to, like, find interesting, anything. Forrest Gump achieves this in spades, and it’s a large part of why that movie is as good as it is. Benjamin Button doesn’t. It’s difficult to relate to his situation of aging in reverse since it’s so foreign from anything most of us have experienced. Roger Ebert goes into greater detail in his review, and it’s particularly his observations on the romance between Button and Blanchett’s Daisy that ring true to me. It, and everything else in the film, is played for sentimental feel-good. It seems that so much more could have been done with the premise if the darker sides of it were explored better. How messed up it would really be to grow younger while everyone around you got older. Maybe make it a black comedy. Something. Anything but the long-winded sappiness we did get. It’s doubly disappointing since it’s Fincher, and this was a huge departure from his previous work. Having made a name for himself with dark thrillers of various kinds, The Curious Case of Benjamin Button was quite the step away from his comfort zone. I applaud him for trying something different, but I don’t think this film was a good fit for him. Fortunately, The Social Network worked much better and his upcoming The Girl with the Dragon Tattoo remake (oops, I mean “readaptation”) seems to be a return to the style where he first gained his fame. Hopefully, Benjamin Button will be proven to be a temporary misstep. The clip below is from fairly late in the movie. There’s nothing big given away plot-wise, but still: minor spoiler alert. I totally agree with you; I was massively excited about Benjamin Button, but it just mostly fell flat to me. Two things I think would’ve made it work much better – eliminating the frame story, and amping up the whimsy. One scene I totally loved was when Benjamin told about the car accident and all the bits of coincidence that led up to it in a very non-straightforward but matter-of-fact way. If there had been more stuff like that, I think it would’ve been wonderful. As it was, it occupied this weird space between fantasy and reality that never quite worked for me. Good call on the frame story. I can’t recall it adding anything crucial to the film overall. What does Hurricane Katrina have to do with anything? More whimsiness would have been another effective path to take. If Button lives such a “normal” life despite his condition, at least present it in an interesting way. Make it fun. Stop trying to take yourself so seriously, movie.